The 71st Highland Park Holiday Parade is taking place on Sunday, December 6, 2015 and you, yes you, are invited to join the Figueroa For All crew in their parade entry this year! Join a very special Figueroa For All crew of bicycles, scooters, walkers, strollers, pedicab riders, tall bikes, freak bikes, cargo bikes, heelies, and wild stallions as we celebrate our favorite places to walk, bike, skate, scoot, and play in Highland Park. When: Sunday, December 6, 2015 at 10 a.m. The parade officially starts at 1 p.m. and we will likely be in the last half of the parade. We’re bringing our kids, you can bring yours too. It will be a fun morning/afternoon of playing, decorating, and hanging out with neighbors and friends. 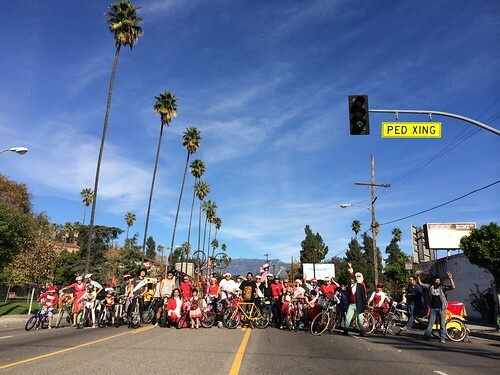 Facebook Event for the Fig4all entry in the 71st Highland Park Holiday Parade on Sunday December 6, 2015. Want to get a jump on bike decorating? Pre-Parade Decorating and Poster Making Party on Saturday, December 5, 2015 from 1 p.m. to 4 p.m. at 5608 Monte Vista St. 90042. Decorating materials will be available. Bring your creativity and any extra materials. Facebook Event for the pre-parade decorating party on the Saturday before the parade.